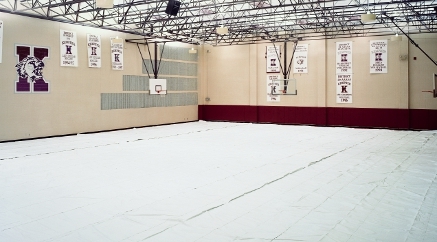 Gym Floor Covers & Tarps - Gymnasium Floor Coverings | Reef Industries, Inc.
Armorlon® gym floor covers help to protect high performance floors from damage during school assemblies or other special events. Featuring a high-strength woven scrim fabric, Armorlon® floor covers provide durable protection and resist rips, tears and abrasion. Strong enough to endure the abuse from events, activities and functions year after year, Armorlon® covers offer cost-effective value. High heels, tables, chairs, food and drinks will wreak havoc on gymnasium hardwood floors that are not protected. Unwanted denting, scuffing and scraping can be avoided by installing a gym floor cover before non-sporting events. Reef Industries offers various gym floor cover products ideal for light, medium and heavy floor traffic. Armorlon® gym floor covers are lightweight yet durable allowing for easy handling, installation and storage. Choose from several material grades of gym floor covers ranging from light to heavy traffic. All material grades can be custom sized and fabricated providing maximum floor protection. Seams are heat sealed offering an optimal bond and a smooth surface. Stay proud of the way your gym floor looks and protect it with Armorlon® gym floor covers. Permalon ® Ply X-200 FR is a fire-retardant laminate with two layers of multi-axially oriented, linear low-density polyethylene. It is specifically engineered to provide high strength and durability in a lightweight material.